I like fish, which is a relatively new development, I suppose. (I’m surprised Hubby didn’t put it in my wedding vows though… Love, Honor, Cherish, Go Fishing, Eat whole fish that are still looking at me on my plate, Till death do us part.) I do not love “fishy” fish though. If you’re anything like me, then this is the perfect salmon recipe for you. 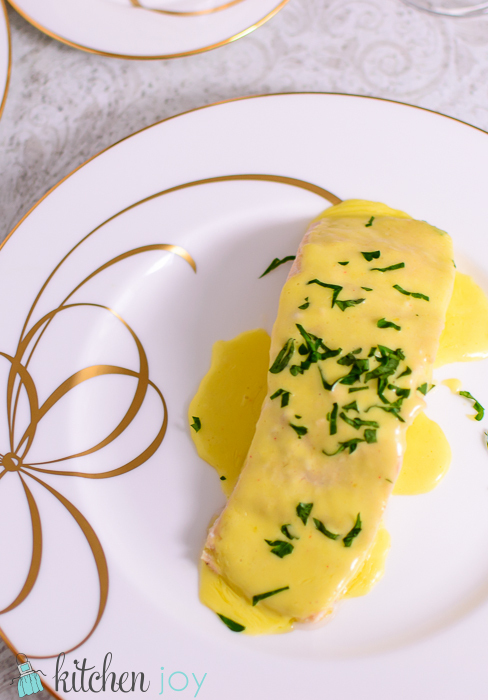 Plus, it’s covered in delicious hollandaise sauce, so what’s not to love about that? 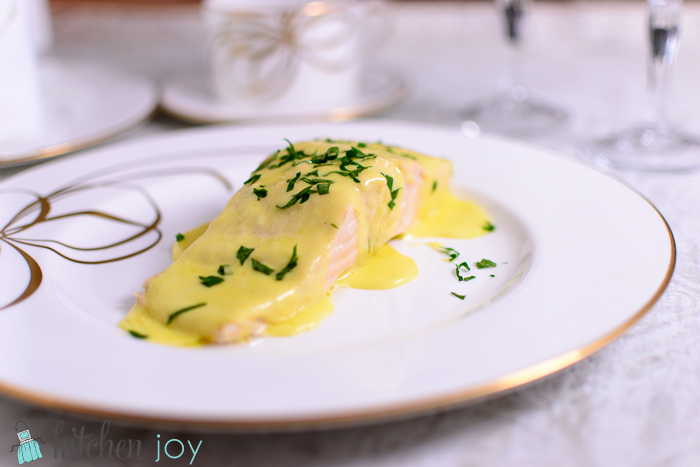 We really enjoyed this as our fish course for our Downton Abbey dinner, and hopefully you’ll try it out and like it as well. We ended up with a perfect amount of leftover hollandaise, so I’m thinking we’ll have Eggs Benedict tomorrow. In a pan that is just large enough to accommodate all 4 salmon fillets without too much extra room, add the 4 tablespoons of lemon juice and 2 tablespoons of extra-virgin olive oil. Add enough to the pan so that the liquid is about 1-inch deep. Season the salmon fillets with salt and pepper, and add the salmon to the pan. Add more water, if needed, to completely cover the salmon. Heat the salmon over medium heat until water is hot, but not boiling or simmering (165 degrees). Poach the salmon in the hot liquid until it is firm to the touch, and has an opaque appearance, and the internal temperature has reached 140 degrees. Simmer some water in the bottom of a double boiler (or a metal bowl set over a pan of simmering water-do not allow the bowl to touch the water). Before placing the bowl over the simmering water, whisk together the egg yolks and hot water. Place the bowl over the simmering water, and whisk constantly until the yolks thicken, double in volume, and turn a pale yellow color. Do not allow the yolks to scramble, remove bowl from heat periodically if you need to. Add the butter pieces, one at a time, whisking each piece in until it melts completely before adding another piece. Once you've added all of the butter to the hollandaise, remove the sauce from the heat and whisk in the lemon juice, cayenne pepper. Taste and season with salt as needed. Drain the poached salmon fillets and place them on a serving platter or on individual dinner plates. Cover the fillets with the hollandiase sauce and garnish with parsley.